If someone says it honestly enough though, Indo-Chinese is completely dependant on bottled sauces (in fact specific to some Indian brands drowsed with preservatives and stabiliser) that makes up the base for these dishes. Soy sauce, chilli sauces, ketchup, green chilli sauce to name a few. And perhaps, that's where my father's dislike comes from. Mom would make these dishes for us though, not as often as we would like but once every few months and make dal for Pappa. While we slurped our noodles, Pappa sipped on his dal with the same pleasure, not once being tempted by our greasy, sloppy, shiny bowl of deliciousness. Now, that I find myself being most cautious of what I put in my system and particularly my wee one's system, I can't help but be in awe of his willpower and conscientious. While I can wake up to tell my husband that I dreamt of the crispy dosa stuffed with szechwan chutney we had on our last trip to Mumbai, it is him, the real lover of all things Indo-Chinese. Born and brought up in the Indo-Chinese capital of sorts - Kolkata, he claims his blood is red from all the chilli sauce laden food of college days. Some 230 years ago, it was in Kolkata, then known as Calcutta, where Hakka immigrants from China started to settle, started little eateries and created 'Chinatown' that to date is the only Chinatown in India. While Kolkata's Chinatown might house the 't'authentic' Indo-Chinese, there no lack of red lanterns lined restaurants in most of metro India. But if not the dimly lit interiors, with bright neon hoarding, dragon sculptures and paintings oozing out fire at the fine to casual dining restaurants, one is sure to find a stall of chowmein, chili sauce specked thin noodles with julienne capsicum and carrots buzzing with large cues on the narrowest, dingiest of streets. Perhaps, my father missed this wave of Chinese insurgence in our cuisine growing up in a tiny village of Rajasthan (which is a relatively more rooted in its traditional food). Now, that my father lives closer, we tend to reconnect about food with small talks about what he ate growing up and the little changes we are making to make our food 'cleaner'. He ate this paneer kebabs after I told him what was in it. He ate up without a word and my husband ate it with pleasure. It's a win. Blitz all the ingredients except the panner in a blender until a smooth paste is formed. I like to keep the chilli slightly chunky but it is up to you. Marinate the paneer in the paste for at least 2 hours. 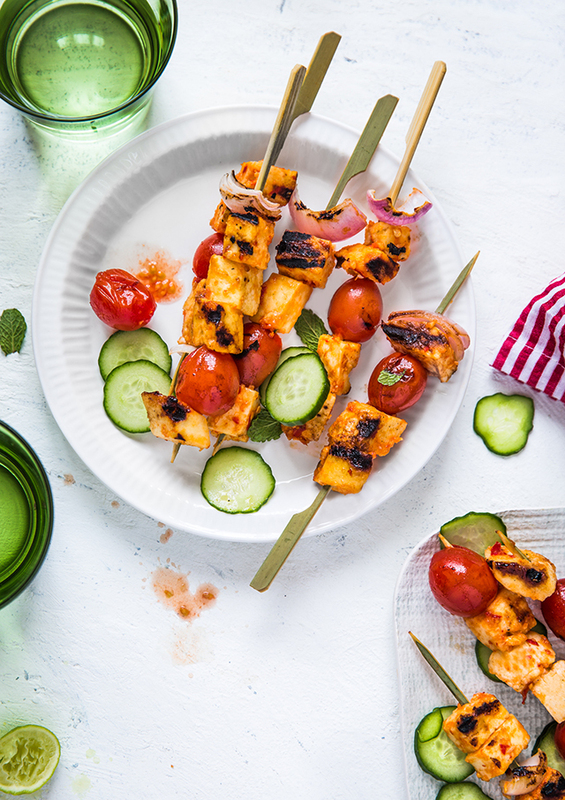 Skewer the paneer alternating with vegetables of choice on wooden skewers and grill them on a grill pan (or barbecue grill or tandoor) for a minute on each side until slightly charred. Brush them with little oil once off the grill and serve hot with lime wedges. 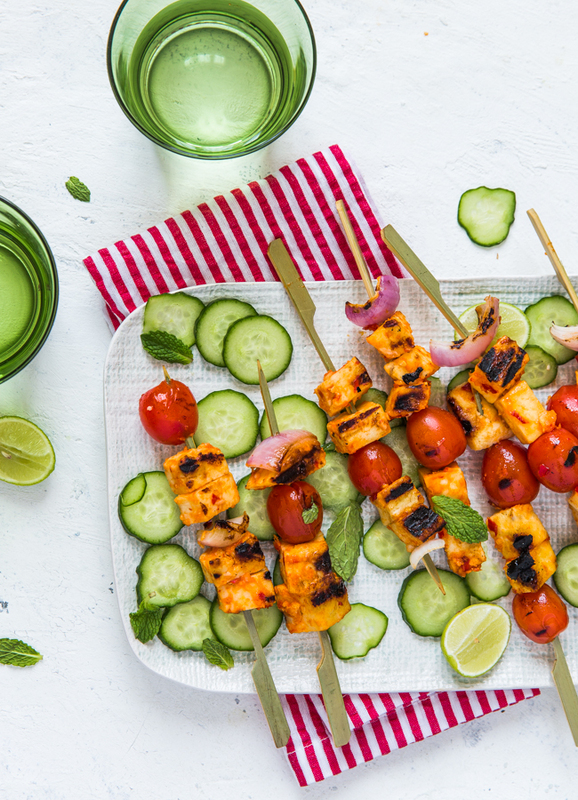 Your paneer kebabs look mouthwatering. A paneer kebab sounds FAB! Loving this! Loved reading the food memories of your papa. And this kebab, is a delight! I've never tried paneer before.. but it sure looks delicious. I am SO inspired to make these kebabs. I hope you do! They are so easy to do too. Have been a lurker here every now and then. More than the recipes or photos (which are really great too), the stories you weave around them are the best ! This recipe was awesome. I made it for a potluck gathering yesterday and it was a huge hit!! Thanks to you….